When Amin Cajee left South Africa to join the liberation struggle he believed he had volunteered to serve ëa democratic movement dedicated to bringing down an oppressive and racist regimeí. Instead, he writes, in this powerful and courageous memoir, ëI found myself serving a movement that was relentless in exercising power and riddled with corruptioní. 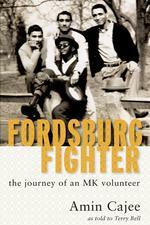 Fordsburg Fighter traces an extraordinary physical journey ñ from home in South Africa, to training in Czechoslovakia and the ANCís Kongwa camp in Tanzania to England. The book makes a significant contribution to the hidden history of exile, and documents Cajeeís emotional odyssey from idealism to disillusionment. At age 19, along with his friend Omar Bhamjee, Cajee was one of the first two Indians recruited in South Africa, to train abroad as a fighter in the ANC’s military wing, Umkhonto we Sizwe (MK). Married for 43 years to Irish anti-apartheid activist Pat Shanks, he is a quietly religious and devoted father and grandfather and lives in London.